Is my pet anxious or fearful by nature? Does my pet show aggression toward other animals, children, or adults? Does my pet have issues coming when called or responding to other basic obedience commands? If you answered “yes” to any of these questions, your pet will probably be more comfortable staying at home. Food – The line for pictures can get long, so be sure to feed your pet (and yourself!) beforehand. Grooming – Give your pet a good brush-out right before you leave to make sure their fur is looking its best. Better yet, schedule a grooming session at our hospital! Training – Waiting in line for pet pictures is a good time to reinforce your dog’s basic obedience skills. If Fido still needs work in this area, The Pet Experts can help! Our certified dog trainer works with dogs of all ages and skill levels through reward-based training. Give us a call for more information. At Naperville Animal Hospital, we’re committed to doing what we can to help homeless animals in our community find forever homes. 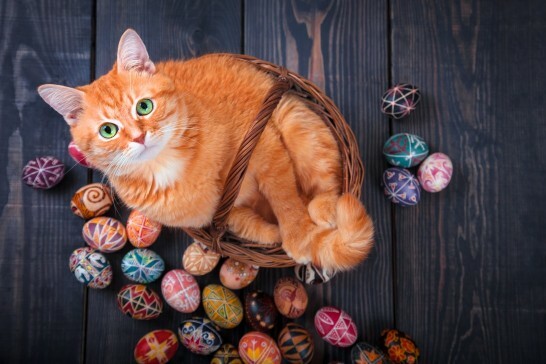 Whether you or a loved one is looking for a new pet or you just want to support a worthy cause, we hope you can join us at our Easter Adoption Event on April 14, 2019 from 11 a.m. to 2 p.m. See you there! Next: Are You Comfortable Performing Pet CPR?